This page lists odonatology references I have come across which pertain to the impact of dragonflies on art and culture. Two small children having fallen asleep are accidentally left behind when their parents and the rest of the villagers abandon their village in a hard times to find food. As time passes, the young boy constructs a toy insect out of corn and grasses to comfort his younger sister. Eventually, the toy comes to life and operates as a messenger between the children and the gods. The insect later takes the name Dragonfly. This teaching story of the Zunis, a Pueblo People based in New Mexico, was first recorded by Frank Cushing in 1883. This short story, titled ``Dragonfly Millionaire'', concerns a poor farmer who fell asleep after tilling his fields. While asleep, he dreamt of a superior quality sake nearby. While he was dreaming, his wife had seen a dragonfly dipping its tail into his mouth several times. Near the rocks where the dragonfly had been they found a small stream that tasted like sake. This story, titled ``Dragonfly Choja'' is a shortened version of ``Dragonfly Millionaire'' by Masa Ohta. The dragonfly, now called "tombo" in Japanese, used to be called "akitsu". Japan was once called Akitsushima meaning "The Island of the Dragon-fly". See Poem 98. The earliest source of Japan's poetry is the Kojiki, the first chronicle of the Japanese nation compiled in 712 A.D. and based on older oral literature. The authors, in Poem 98, relay the story of the Emperor being bitten by a horsefly which was subsequently eaten by a dragonfly. In honor of the dragonfly, he named Japan (Yamato) the Isles of the Dragonfly. I just picked these two but there were a number of others. Myths and Legends of Japan by F.H.Davis pg 282 1932? If a dragonfly is tied on one's hair he/she becomes crazy. Insects are a common motif in jewellry - necklaces, pins, bracelets, earrings. 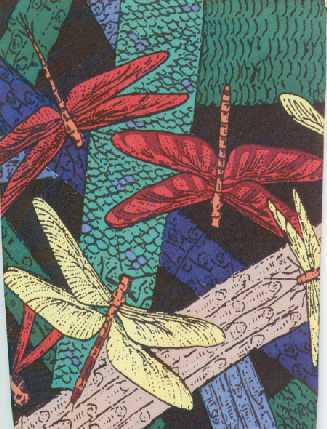 Dragonflies are often depicted. Interestingly, perhaps because they look incomplete to the designers, many of these dragonflies have significant antennae. The boldest dragonfly pin I have seen had a winspan of 3-4 inches. The wings were filled with blobs of baltic amber; the sterling silver body and head were fully articulated. Needless to say this was a unique piece, costing about $180 U.S. It is not in my collection. The author shows how the crosses brought by the missionaries were incorporated into the cultures and designs of the Native Americans of the southwest deserts. Their ready acceptance lay to some extent in its symbolic connection, particularly the double-barred cross, to the dragonfly, an important insect in Zuni lore. 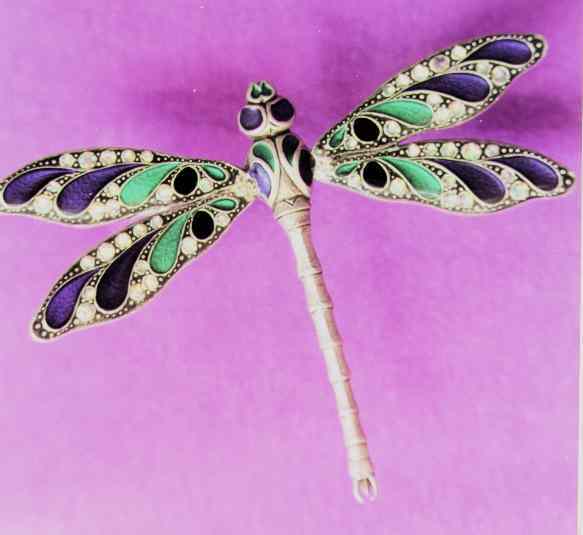 Dragonfly Brooches by R.K. Liu (Ornament Summer 1997 page 24-25) This short article comments on the dragonfly as a motif in jewellry. There are several nice pins shown, including the one available in the link above. In addition, there is a picture of a beautiful carved boxwood netsuke, showing a damselfly and its reflection in water. Traditionally known as katsumushi or the "invincible insect", the dragonfly was a favorite symbol of strength among Japanese warriors. The dragonfly on the front of this helmet is done in gold laquer with black and red markings. American Indian Art by Norman Feder (1995 Edition) pub. by Harry N Abrams Inc.
On pg. 72 in a discussion about carved stone pipes and pipe stems Feder says, ``Teton Sioux specialize in shallow relief carvings of deer, turtles, sheep, elk and dragonflies.'' Black and white plate 45 pictures a carved wooden pipe stem, collected in 1900 and catalogued in the Denver Art Museum as item number PiS-25, which has a dragonfly carved in low relief. The accompanying note says that the pipe stem has the typical form of a Sioux pipe stem. Rock art images from the Hopi Mesas in Arizona, Zion Nation Park in Utah, and kiva murals in the Awatovi and Kawaika-a ruins in Arizona are shown. (The kiva images are from Kiva Mural Decorations at Awatovi and Kawaika-a by Watson Smith pg 218-220 c 1952 pub. by the Peabody Museum, Cambridge, Mass.) In general, a dragonfly is represented by a vertical line with two, or occasionally one, horizonal cross line. The lines are sometimes fleshed out, and the bodies sometimes have dot-like heads. The first dragonfly image shown by Patterson looks to me more like that of the water skate (or water strider) shown later in the book. Dragonflies are shamanistic creatures with supernatural powers. Images are most often found on altars, pottery and petroglyphs. The Zuni Indians are Pueblo Peoples of the American Southwest (New Mexico). The museum sells a very nice dragonfly-patterned silk tie, produced for the opening of its ``Prehistoric Journey'' exhibition. If you are there, check out the exhibit. There is an interesting movie clip of a dragonfly in a wind tunnel. There is also a model used to study the dynamics of dragonfly flight. There are several prehistoric-sized dragonfly models hanging in the dining area at the Desert Museum in Tucson Arizona. Time Before Morning - Art and Myth of the Australian Aborigines by Louis Allen c 1975, Thomas Crowell Co.
On page 91, there is a picture showing the dragonfly after creation by Mudungkala. The story of Mudungkala related in the text is from the Tiwi tribe of Bathurst and Melville Islands. Please feel free to send additions to my cultural list to me and thanks!